In the basic UI, is there a way to play an item in a playlist and display, in columns, the start and end time for each of the remaining items in the playlist? I think that is not possible. I assume you mean to add track lengths together to get a start time? - no, title formatting can only reference information from the one track, and cannot see the next track. But, if that is so, how can it display a total time for highlighted tracks? Forgive me if this is a stupid question, but it seems there should be a way to accomplish this. 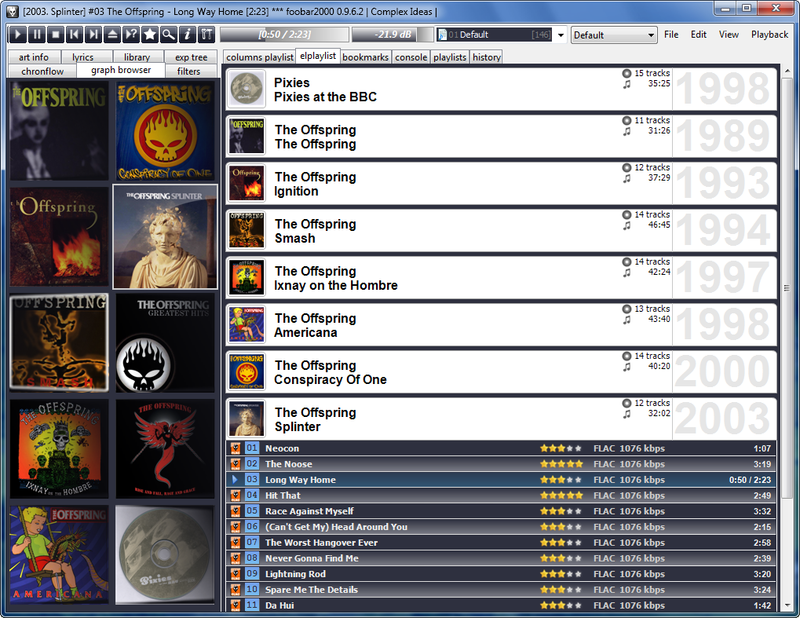 If total length of tracks is what you're after this is somewhat possible with Columns UI using ELplaylist. %el_sum_length% shows total length of a group. This means if the playlist is grouped by artist, each header will display the total length of all tracks in the artist group. Here's an example grouped by album. Thanks for the response. That's cool, but not what I'm trying to accomplish. I use the basic UI in Foobar. When I highlight one or more items in a playlist, it shows me (in the status bar at the bottom) the total time of all those highlighted. What I'm hoping to find is a feature like we have in the Arrakis Extreme automation software we use at the station I work at. When an element in the playlist is played, there is a box beside each following element that shows what time it will start. I was hoping it might be possible to have the same thing in foobar showing the start and end times of elements in an active playlist listed in "Start" and "End" columns. I use the basic UI, I'm a KISS kind of guy. But wouldn't mind if it could be done in Columns UI. But, if that is so, how can it display a total time for highlighted tracks? Because that is not title formatting... that is foobar2000.exe itself doing the math. To be clear, when you say start/end times, are you talking about accumulative track lengths (3m55s, 8m55s, etc), or are you talking about time of day (1:05pm, 1:10pm)? Foobar has no native field for the current time, but Dynamic Fields component adds %now% functions that can be used for time difference. ("Track was played 3 days ago"). It still uses title formatting though. Anyway I should revise my previous response - it would be possible IF it was built into a component. I think all the playlist components - ES/EL/Sim (and Facets) - have group totals for %length% etc. Presently however, I'm not aware of a component that adds on a per track basis. The difference is foobar and components are programmed in C++ to do that. As users, we only have title formatting to use. And to my knowledge that has no way to access the next track - have a look at the reference document. (You can get a track time countdown with %playback_time_remaining% but that is neither here nor there). So that is my take on it anyway and perhaps I'm wrong - would someone with programming knowledge like to chime in? Cummulative track times are probably doable with WSH/JScript/Monkey panel components. I recall marc2003 making a similar script at some point that could be perhaps repurposed. However neither the script nor he is available on this forum anymore (as far as I know). Anamorphic - Thanks! Yes, I was trying to get time of day (1:05pm) the element would start. No problem getting cumulative time and time remaining. Didn't realize I was shooting for the stars. Appreciate the response!